String Duo for Afternoon Tea at Chicheley Hall – On a Sunday in early November, our string duo¬† were engaged to play for an afternoon tea party at Chicheley Hall, located near Newport Pagnell in Buckinghamshire. The occasion was a 50th birthday party. 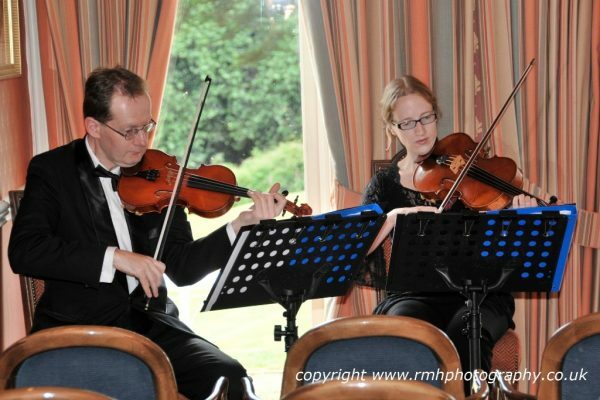 If you’re considering hosting a tea party and are worried that it may end up costing a lot of money, it may be worth considering hiring a string duo or violin and piano duo as these can provide a wealth of music at a very reasonable price. These combinations can either provide background music or a formal concert where the music is more in the foreground. We began playing as guests started to arrive and performed a set of classical pieces by Bach, Beethoven, Elgar, Grieg and Delibes. The first part of the engagement involved guests enjoying a drink as the music reverberated around the attractive acoustics. For the second part, everyone took their seats and enjoyed tea as we entertained everyone with a selection of rock and pop classics, from Aerosmith to Madness. Our last participation came in the form of a rousing ‚ÄòHappy Birthday’, which we played along with the guests and this came just after the speeches had been made. A fitting conclusion to a memorable occasion!